Over the last years, multi-material design aiming on manufacturing of application-optimized technical components has been gaining in importance. In this context, combination of steel and aluminum offers an effective solution for implementation of lightweight concepts due to its high strength-to-weight ratio. The steel can be placed in high-stressed areas, where high performance properties are required, while the aluminum can be used for the rest of the part, in order to save the component total weight. Due to dissimilar material properties of steel and aluminum, the process design for bi-metal forming is very challenging and requires a process-specific heating strategy, which development is in focus of this paper. The current study involves the potential for creating bi-metal bearing bushings consisting of steel 20MnCr5 and aluminum AA-6082 by closed-die-forging. Firstly, an overview of modern technologies for bi-metal forming is given. In following, the scientific issues and demanding challenges within this study are described for both, heating and subsequent forming. Results of the initial computer modeling and experimental validation of the heating behavior are presented. Subsequently, the experimental forging tests were conducted with achieved temperature gradients. The forged parts were metallographically investigated to examine the resulting quality of the joining zone. Based on the obtained findings, the optimization proposals for the entire process are discussed. The world-wide competition in the transportation industry awakes a growing interest of manufacturers in developing of cost-effective and environment-friendly technologies reducing fuel consumption. This trend results in increasing demands on technical components and requires production of high performance components with advanced functionality and weight reduction at the same time. Conventional materials can not satisfy all these requirements due to material-specific limitations. Multi-material designs afford the opportunity to place the appropriate material at the appropriate location with regards to individual operational conditions. When combining the benefits of different materials in a single component, it is possible to create application-optimized parts with a significant weight reduction while maintaining high durability and performance. In this context, combinations of dissimilar materials, such as steel and aluminum, are becoming increasingly important for research and development. However, the forming steel-aluminum components is rather challenging due to various thermo-physical properties of each individual material. The most challenging is the forming temperature of steel significantly exceeds the melting point of aluminum. In order to achieve correct material flow and complete die filling, specific heating strategies are necessary to create the appropriate temperature gradients between different regions in the component. The current study introduces a method for the production of bi-metal bearing bushings by closed-die forging. The overarching goal was to examine the feasibility of this approach for bi-metal forming and to establish the effect of the thermomechanical processing during heating and forming on the bond quality. To study the process, bi-metal workpieces joined by shrink fitting were used. 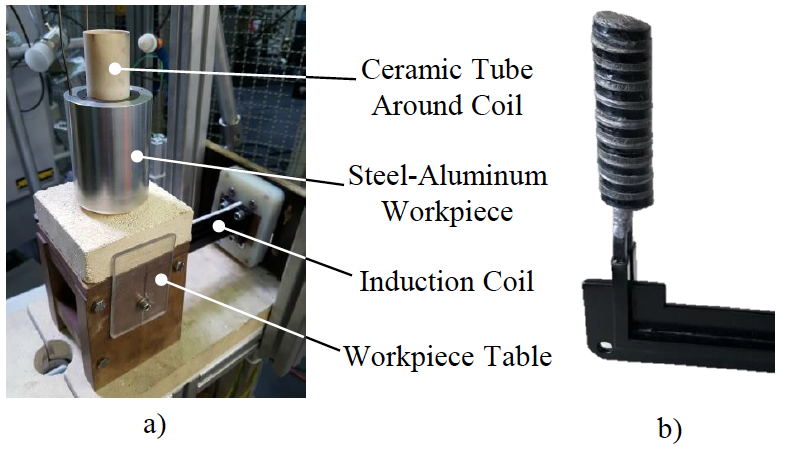 In order to define the temperature distribution appropriated for the subsequent forming, the induction heating process was investigated by modeling and experimentation. Besides the achieved temperature gradients used for the forging experiments, forged bearing bushings and results regarding material flow, microstructure and the bonding zone are demonstrated. Additional considerations are given on how to further improve the process and move towards a production capable process. At the industrial scale, multi-material machine components (i.e. brake discs, hydraulic cylinder rods, valves, shafts, etc.) are commonly fabricated by joining two individual components which are already given their near-final or final form. An alternative solution is represented by the bulk metal forming of multi-material components, where forming and joining can be combined within a single process step. In the recent years, joining by plastic forming was studied in several research works. Plancak et al. performed analytical and experimental compression tests on coaxial bimetallic workpieces consisting of two different steel materials (C15E/C45E), in order to investigate load characteristics during the forming depending on different upset ratios . Sun et al. 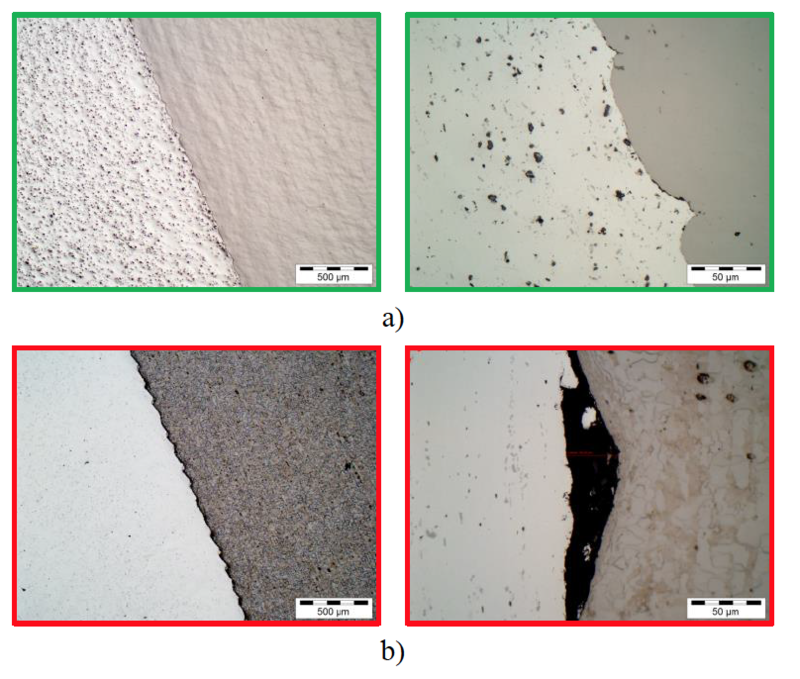 investigated the metallurgical bonding process of bimetallic hot deformation and influence of process parameter on the diffusion behavior of different elements . The compression tests were conducted under isothermal conditions using a serially arranged combination of a carbon steel Q235 and a stainless steel 316L. The study showed that element diffusion distance in the interface zone increases with effective strain, temperature and time during both, forming and holding stages, to different degrees. Behrens et al. studied compound forming of bi-material shafts by indirect impact extrusion of different steel combinations such as a structural steel S355J and a heat-treatable steel 42MoCr4 . Tensile tests of bimaterial specimens showed that a failure is located outside of the joining zone, which means a good bonding quality between materials after forming. The results were transferred to the precision forging of bi-metal spur gears with different diameters of core material and various thickness of wear-resistant ring materials. Politis, et al. presented compound forging of gears made of dissimilar material combinations utilizing steel or copper on the outer diameter and aluminum, copper or lead for the inner core [4, 5]. 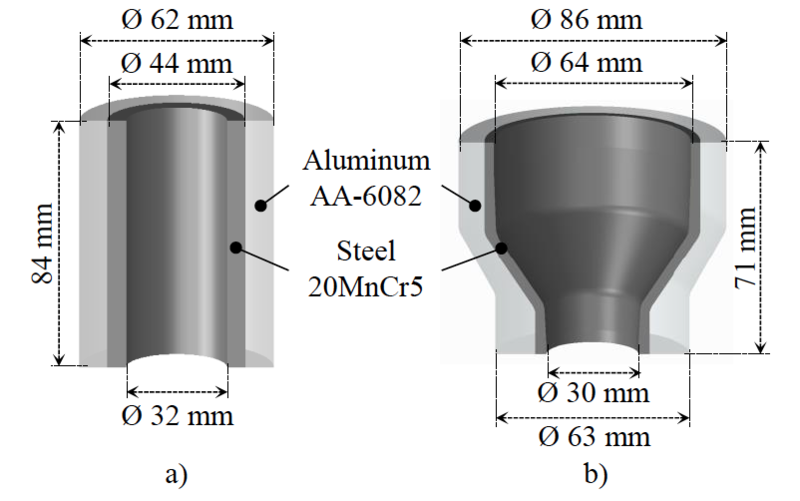 Äyer used a numerical and experimental approach for upsetting bi-metallic hollow cylinders made of copper and aluminum in order to investigate the material flow behavior during the forming . A similar research work was carried out by Misirli et al. on bi-metal workpieces consisting of a steel outer ring (AISI 102) and brass or copper inner cylinder . Kong et al. investigated manufacturing of steel-aluminum-compounds (AISI 316L/6063) by forge welding with various process parameter including temperature, amount of diameter and forging speed. It was established that the forming temperature has the most decisive influence on the resulting quality and the tensile strength of the joint . Wohletz and Groche elaborated a joining process by combined forward and cup extrusion and compared the joining of steel C15 and aluminum AW 6082 T6 at ambient and elevated temperatures . It could be stated, that elevated forming temperatures have a positive impact on the final bonding quality while it is negatively affected by the emerging oxide scale which grows with increasing temperature. Kosch and Behrens investigated the compound forging of hybrid workpieces in the context of non-uniform temperature distribution between steel and aluminum raw parts and its influence on the emerging intermetallic phases . Chavdar, Goldstein et al. used tailored heating strategies for hot forging and hot hydroforging of aluminum workpieces fully encapsulated within a steel shell, where the aluminum core was formed in a semi-solid or completely molten state [11, 12]. The current study deals with manufacturing of a bearing bushing consisting of steel 20MnCr5 on the internal diameter and aluminum AA-6082 on the external diameter. The inner rolling surface is exposed to high stresses due to bearing balls and requires an application of high performance and wear resistant material such as steel. Removed from the high-stressed regions, lightweight materials with high toughness, ductility and breaking resistance such as aluminum can be used for reducing of total weight of the part. The coaxially arranged bi-metal workpieces were designed in accordance with the stress conditions operating in the final parts. In this study, two concentric cylinders were joined together by shrink fitting and subsequently formed to the final geometry. The models of investigated bi-metal workpieces and bearing bushings are presented in Fig. 1. In order to achieve sufficient formability, the bi-metal workpieces have to be heated up to material-specific forming temperatures. For this purpose, a tailored heating strategy with radially inhomogeneous temperature distribution is required. For forming without cracks or other material defects, the warm or hot working temperature range (greater than 700 °C) should be obtained in steel. At the same time, the aluminum temperature is limited to the melting onset (solidus temperature) at approx. 580 °C. Reaching of required temperature gradient within the bi-material workpieces is possible using induction heating. Induction heating is a volumetric heating method where power is controllable along the surface and in the depth of the workpiece. With the appropriate coil design and proper selection of frequency, it is possible to deposit electrical energy into the steel component with almost no direct inductive heating of the aluminum component. Using induction heating, the heating process can be tailored to achieve different temperature gradients in the composite structure to optimize the forming process . 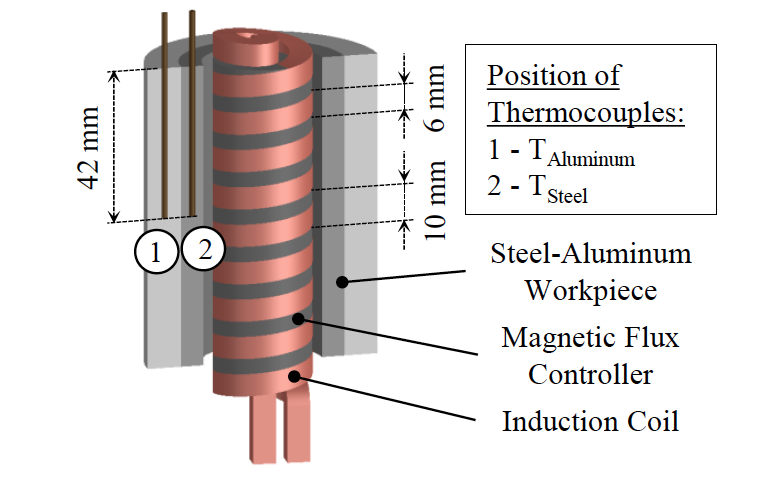 According to the geometry shown in Figure 1, an induction heating concept with a water-cooled inner induction coil with magnetic flux controller was designed (Fig. 2). With this construction, the eddy currents are primarily induced in the inner periphery of the workpiece, which leads to a more pronounced heating of the inner steel ring compared with the aluminum. The heating of aluminum outer ring is due to conductive heat transfer from steel to aluminum. For experimental heating tests a middle-frequency generator Huettinger TruHeat MF 3040 with a frequency range between 5 and 30 kHz and a maximum output power of 40 kW was used. The induction coil was connected to capacitor box with total capacity of 47.1 μF included in an oscillating circuit. The heating process was controlled with set value presetting via percentage of the maximum voltage (300 V). For achieving the largest possible temperature difference between steel and aluminum in a short time, all tests were carried out at 100%- voltage with various heating times. The maximal operating frequency was approx. 16.5 kHz. 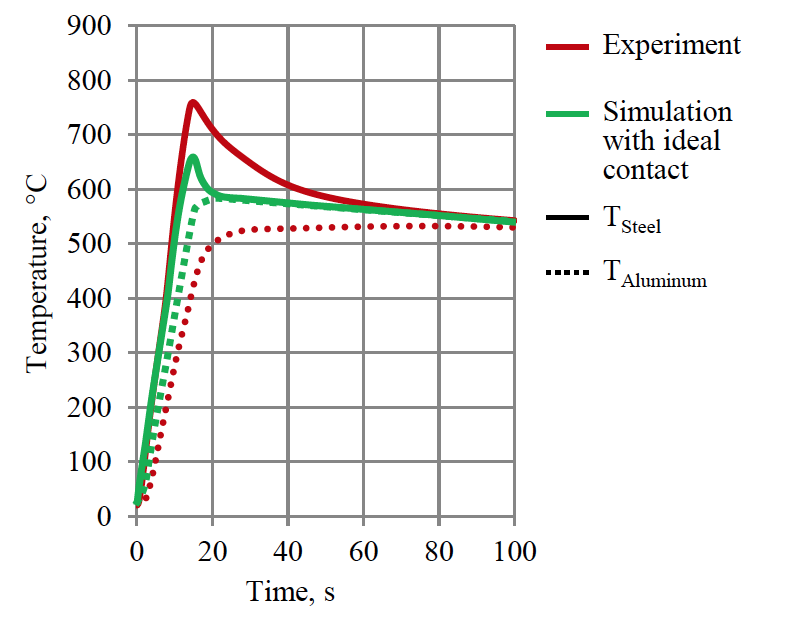 During the heating tests, time-temperature curves were recorded for the reference points in the middle of steel and aluminum rings, which are shown schematically in Fig. 3. For the measurements, the mineral insulated NiCr-Ni thermocouples (Type K) with an Ø 1.5 mm stainless steel sheath were used. In order to complement the experimental temperature values and to predict the radial temperature distribution after the heating and transportation time, the induction heating process was modeled using the electromagnetic and thermal analysis software ELTATM. The main challenge of bi-metal heating modeling is to identify the thermal contact properties between steel and aluminum, which have a significant effect on the resulting temperature gradients. For this reason, the simulated thermal behavior should be matched to the experimental data [11, 12]. In Fig. 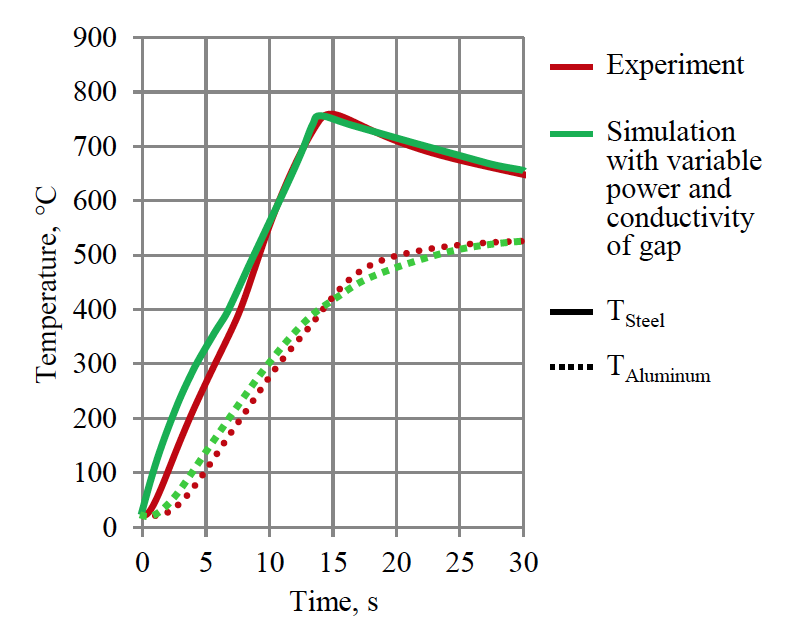 4, the experimental temperature curves for the heating time of 14 s are compared with simulated results under ideal thermal contact condition between steel and aluminum. In both cases, the curves equalizes at the same temperature, which means that the heating was performed based on the same total energy input. More efficient contact provides for faster equalization of temperatures, what can be explained by higher heat conduction from steel to aluminum. 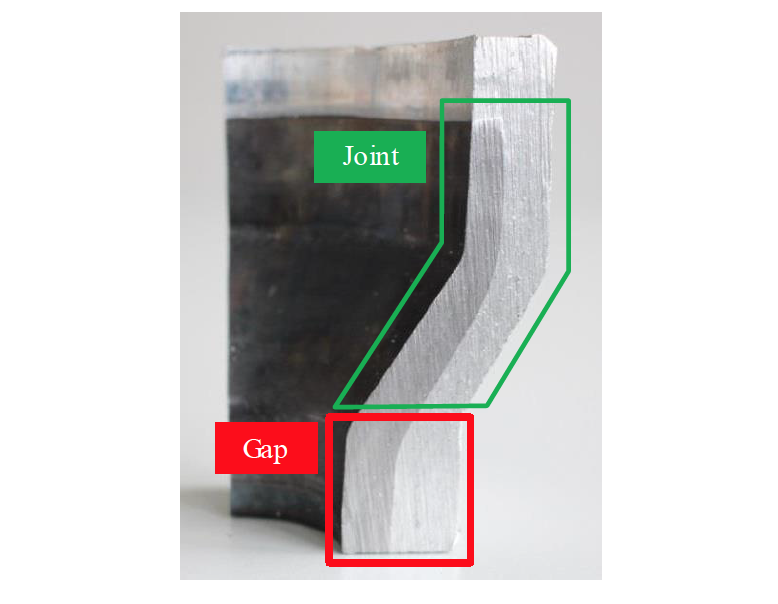 Under real-life conditions, the connection in bi-metal workpieces without metallurgical bonding is not perfect. This results in significantly less heat transfer and slower heating of the aluminum ring. Therefore, the temperature equalization takes a longer time in workpieces produced by shrink fitting. In this case, a higher temperature gradient between steel and aluminum is favorable for the subsequent forming process. It should be taken into account that the contact characteristics between steel and aluminum are not constant over the heating time. Due to different thermal expansion of steel and aluminum, the gap between the materials grows with increasing temperatures. This behavior can be proven by experimental investigations. Fig. 5a shows the temperature curves with various heating time (from 10 up to 14 s). The resulting absolute temperatures and temperature gradients between steel and aluminum are different, but the initial heating process is reproducible for all of the tests. In Fig. 5b, it can be seen, that the temperature curves for steel have a slight bend at the same point, when the steel temperature (approx. 400 °C) is about two times higher as the aluminum temperature (approx. 200 °C). Higher heating rates of steel after this point can be explained by lower thermal conduction from steel to aluminum due to increasing gap size between steel and aluminum parts. This effect should be considered by modeling of the heating process. In order to reproduce this phenomenon in heating simulation, a thin layer with temperature dependent conduction properties was integrated in bi-metal workpieces between steel and aluminum [11, 12]. The temperature curves received with validated model are shown in Fig. 6. They have a good agreement with the experimentally measured temperatures. The slight deviation at the beginning and the end of the heating process can be explained by thermal lag of the thermocouples because of relatively big diameter of their steel sheath. Forging processes represent a promising method for forming of bi-metals due to a lot of benefits, such as outstanding material properties, uninterrupted grain flow and homogeneous structure, exhibited by forged parts. Moreover, forging at elevated temperatures enables reaching high strains and forming complex geometries in a single stroke. Additionally, the thermal and mechanical influence during the forging can lead to improving local mechanical properties and the quality of the resulting joining zone. For the manufacturing of the bearing bushings from bi-metal hollow workpieces, a single-step forging process was designed. The forming is performed in a closed-die forging system, which is presented in Fig. 7. Within the forging stage, the material is formed by two active tool components – the punch and the closure plate. While the upper punch gives the inner shape of the bushing, the closure plate attached to the moving frame by a set of disc springs ensures the final height of the forgings. At the end of the forming process, the forged bushing is automatically detached from the upper punch with the force stored in the disk spring stacks. A hollow ejector system then removes the final bearing bushings from the forging die. Before the forming process, the warm workpieces were automatically transferred from the induction heating unit to the forming tool by means of a programmable robot arm to ensure high reproducibility and to limit heat exchange during the transportation. The transportation time was limited to 6 s for all of the forging tests. After the forging, the final parts were cooled down by air. The maximum heating time during the experimental investigations was limited to 14 s. With increasing heating time, the temperature of steel and aluminum equalizes above the solidus temperature, which leads to the partial melting of aluminum. Fig. 8 represents the temperature evolution for three heating strategies (a, b and c) with various heating time. The diagrams show the radial temperature distribution directly after heating and transportation time. The temperature profiles after the transportation corresponding with the forming temperature are of great importance for the following forming process. In strategy a (Fig. 8, left), the steel shows the lowest temperature and thus will have reduced formability compared with other heating strategies. At the same time, the heating strategy b (Fig. 8, middle) leads to the largest temperature gradient between the steel and aluminum and thus is the most suitable for the subsequent forging. The final temperature of steel is between 700-750 °C and the temperature of aluminum is about 430 °C. With the heating strategy c (Fig. 8, right), the similar steel temperature has been achieved, although the entire heating phase was longer in this case. With this strategy, the aluminum is heated to a higher temperature of approx. 480 °C after the transportation due to its high thermal conductivity and thus a lower temperature gradient compared with strategy b can be achieved. Based on conducted investigations, heating strategy b with heating time of 13s and transportation time of 6s has been primary used for the subsequent forming tests. The bearing bushing forged using the selected heating strategy is presented in Fig. 9. Due to the lower flow stress, aluminum flows over the steel and forms an undercut in the upper part of bearing bushing. The steel in upper part undergoes a high radial expansion leading to a wall thickness reduction from 6 to 5 mm. In contrast to this, the wall thickness of steel part is increased up to 7 mm in the bottom area possibly due to axial upsetting. As observed in Fig. 9, the bearing bushing exhibits a sufficient macroscopic form fit between the steel and aluminum part. For detailed characterization of bonding quality, the specimens extracted from the forged bearing bushings were metallographically investigated. The metallographic cuts with resulting joining zone are presented in Fig. 10. In general, two zones with different bond quality can be indicated as shown in Fig. 9 (green, red). In the upper area, a form- and force-closed joint has been achieved (Fig. 10a, left). In addition, a wavy topography from the finishing process can be observed in a higher magnification (Fig. 10a, right). In the bottom area, an undesired separation was detected (Fig. 10b, left). Due to the similar topography of both materials in some areas of the interface zone, it can be assumed that the separation is partially caused by shrinkage during the cooling process. A maximal gap size of approx. 40 μm was measured (Fig. 10, right). The presented work is focused on the issues occurring during the forming of bi-metal components. In this case, employed heating strategy becomes a key tool to control the temperature distributions in the component which are critical in efforts to achieve appropriate material flow during the forming process. In this context, a process for production of steel-aluminum bearing bushing including the FE-aided development of a reliable inductive heating strategy has been designed. The feasibility of the developed methods has been successfully validated with an experimental forging study. Metallurgical evaluations were conducted on the formed bi-metal components. The metallurgical studies showed good bonding with both the form- and force-closed joint were achieved in the areas with high deformation. In the bottom area of bearing bushing, where the material is less deformed, the resulting bond quality was poor. Thus, the forming process (e.g. punch geometry) or the heating strategy (higher temperature gradients by changing the input power) needs to be improved to ensure sufficient bonding over the entire joint zone. Metallurgically bonded bi-metal blanks produced by coaxial lateral extrusion will be employed in the further investigations. Thus, the materials will be joined prior to forming, which should have a further positive impact on the resulting joint quality. However, due to improved contact between the workpieces, higher power from the induction heating power supply would be beneficial in achieving the desired temperature gradients. The results presented in this paper were obtained within the Collaborative Research Centre 1153 “Process chain to produce hybrid high-performance components by Tailored Forming” in subproject B2. The authors would like to thank the German Research Foundation (DFG) for the financial and organizational support of this project. Plancak, M., et al., “Compression of bimetallic components-analytical and experimental investigation,” Annals of the Faculty of Engineering Hunedoara, Vol. 10, No. 2 (2012), pp. 157-160. Sun C. Y. et al., “Element diffusion model of bimetallic hot deformation in metallurgical bonding process,” Materials & Design, Vol. 94 (2016), pp. 433-443. Behrens, B.-A., et al., “Investigation of load adapted gears and shafts manufactured by compound-forging,” Journal of Advanced Manufacturing Systems, Vol. 7, No. 1 (2008), pp. 175-182. Politis, D. J., et al., “An investigation into the forging of Bi-metal gears,” Journal of Materials Processing Technology, Vol. 214, No. 11 (2014), pp. 2248-2260. Politis, D. J., et al., “Investigation of material flow in forging bi-metal components,” Proceedings of the 14th International Conference on Metal Forming, January 2012, pp. 231-234. Ayer, Ö., "Material flow analysis of bimetallic hollow disc upsetting," 6th International Conference on Trends in Agricultural Engineering, September 2016, Prague, pp. 38-43. 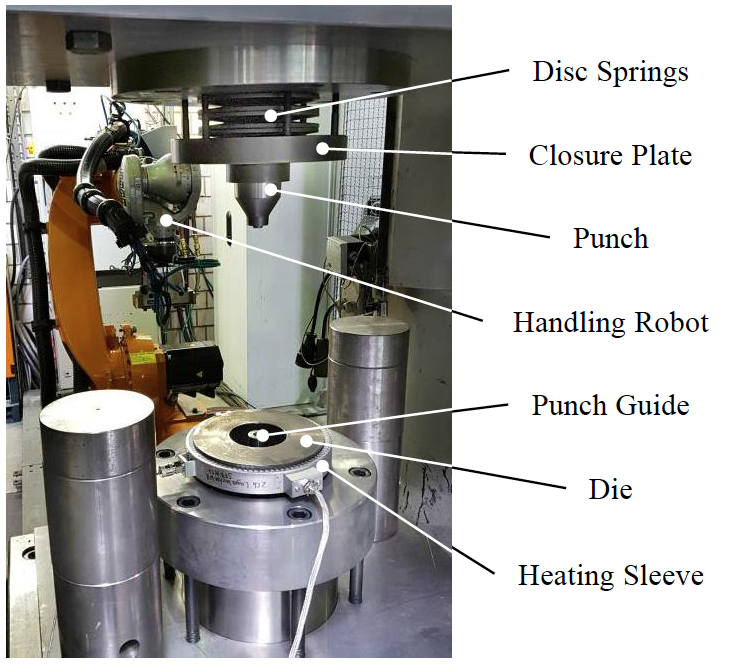 Misirli, C., et al., “ Experimental and fem study of open die forging for bimetallic cylindrical parts produced using different materials,” International Journal of Modern Manufacturing Technologies, Vol. 8, No. 1 (2016), pp. 69-74. Kong, T. F., et al., “Experimental Study of Effects of Process Parameters in Forge-Welding Bimetallic Materials: AISI 316L Stainless Steel and 6063 Aluminium Alloy,” Strain, Vol. 45, No. 4 (2009), pp. 373-379. Wohletz, S. and Groche, P., “Temperature Influence on Bond Formation in Multi-material Joining by Forging,” Procedia Engineering, Vol. 81 (2014), pp. 2000-2005. Kosch, K.‐G. and Behrens, B.-A., "Challenges in Compound Forging of Steel‐Aluminum Parts," EPD Congress 2011, John Wiley & Sons, Inc., pp. 169-176. Goldstein, R., et al., “Modeling of the Heating Sequences of Lightweight Steel/Aluminum Bimaterial Billets for Hot Forging and Hot Hydroforging,” 23rd IFHTSE Congress, pp. 18-22. Abrikosov, A. A., Fundamentals of the Theory of Metals, Vol.1, North-Holland (Amsterdam, 1988).